The British playwright's account of becoming a writer amid the enormous flux of postwar England and his breakthrough successes as a playwright amid the political ferment of the ’70s. What’s extraordinary about The Blue Touch Paper is how much intellection and drama and sensibility and wit Mr. Hare squeezes into the telling of his first three decades or so. This is no butterfly-watching stroll through a life. Mr. Hare is a man who seizes on details and ideas, and who writes as if words matter. ...Hare’s detailed account of his artistic evolution [gives] us an intelligent, unsentimental glimpse inside the creative process. But all credit to Hare for giving us his shabbiness as well as his triumphs. By the time he brought down the curtain I had come to understand what a vibrant force he has been for wringing excellence out of people, including himself. 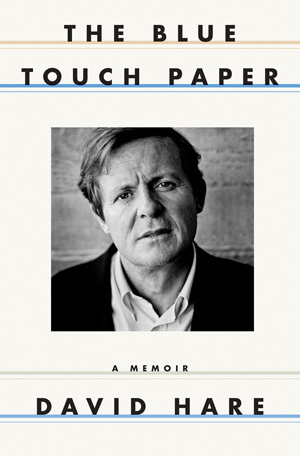 The Blue Touch Paper is an engrossing dive into the passions, the disappointments, the quarrels and the elation of a great professional trying to get something done. What did you think of The Blue Touch Paper?